Besides that Laos is one of the poorest countries of Asia and one of the last communist countries, Laos is also one of the last hidden treasures and is reminiscent of Thailand before the start of mass tourism. Bordered by China, Vietnam, Cambodia and Thailand, Laos has seen a surge in tourist numbers lately and has managed to do so without the commercialization you see in next door Thailand. Lack of tourist and transport facilities means that travelling around Laos is more changeling and also as a result more laid-back. Nobody is in a hurry and everybody smiles. Most tourists come here for the relaxed atmosphere and the impressive nature. In the north, near Vang Vieng, the huge Mekong River has created some unique limestone karsts while in the south the Four Thousand Islands (Si Phan Don) give an amazing view of rice paddies, small villages with in the back the mighty Mekong river. You can see the largest waterfall in Southeast Asia here and if you are really lucky the Mekong dolphin. At the Plane of Jars you can see thousands of stone jars from the Iron Age scattered around the landscape. 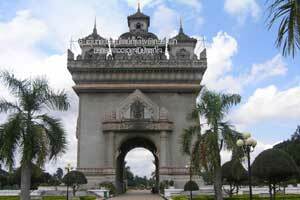 In Vientiane are several museums and temples worth a visit, also be sure to visit the National monument (Pha That Luang) and the Victory Gate (Patuxai). Trekking, kayaking, cycling and the famous tubing at Vang Vieng are all popular activities in Laos. Tubing in Vang Vieng is floating down the Mekong River on a inflatable tube while on the way drink beer in the dozens of bars that line the route. There are other locations where you can float down more quietly without loud music coming from the bars. Laos has a unique proverb saying "œVan pen lom, khom pen yaÃ¢", which means that sweetness will make you dizzy, while bitter will make you healthy. The cuisine is similar to the nearby region of northern Thailand, very spice, lots of fresh herbs, raw vegetables and often bitter. The French have left a bread culture and you can get croissants and baguette everywhere. Need place to stay in Laos? 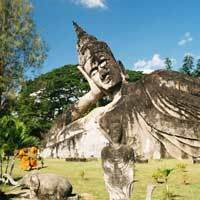 Look for more Cheap Flights to Laos.